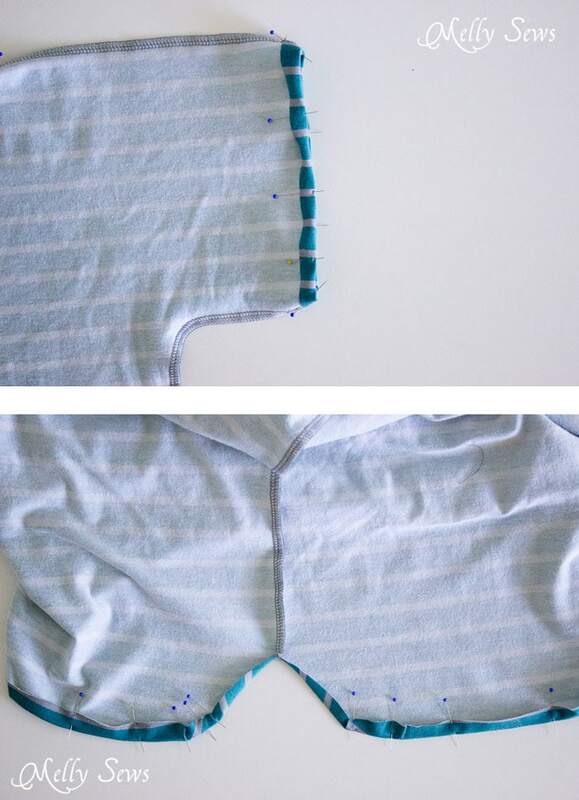 Hey y’all – today I’m sharing this tutorial showing how to sew a shirt – which is SUPER easy and you can make this out of basically any knit fabric at all. PLUS no pattern needed because it all starts with a rectangle, so you can make it in about 20 minutes! To make this, you’ll need two pieces of knit fabric that are about 30 inches long and about 40 inches wide. After you have your two rectangular pieces, place them together and fold them in half, matching the short edges. Then you’re going to make cuts as shown above. 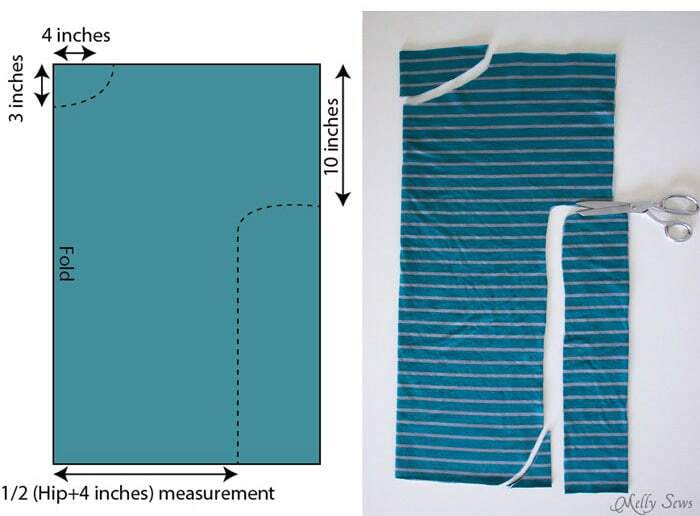 Make one cut to form the side seam, and one for the neckline. Then, if desired, cut off the bottom corner to round the hem. 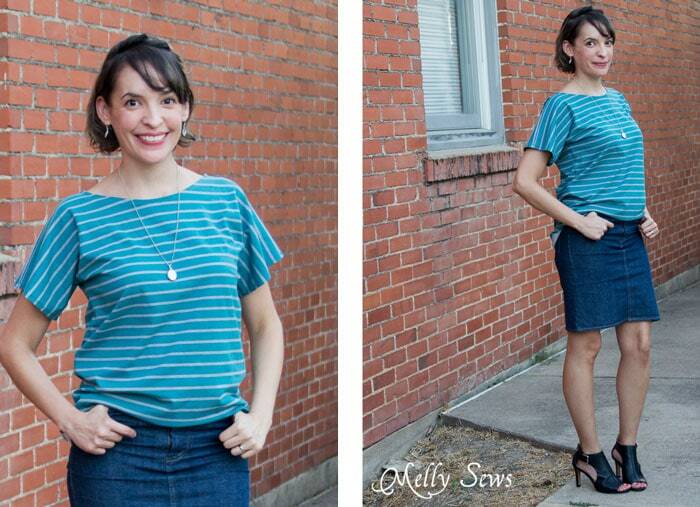 This cut is optional, if you want a straight hem all around, that works too. Place the two pieces right sides together. 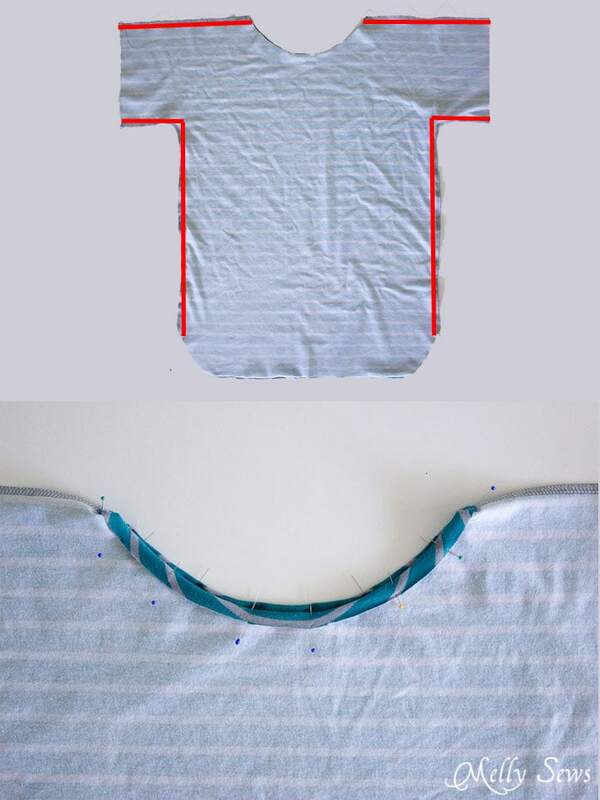 Sew across the shoulders and down the side seams as shown below, using a stretch stitch. New to sewing knits? 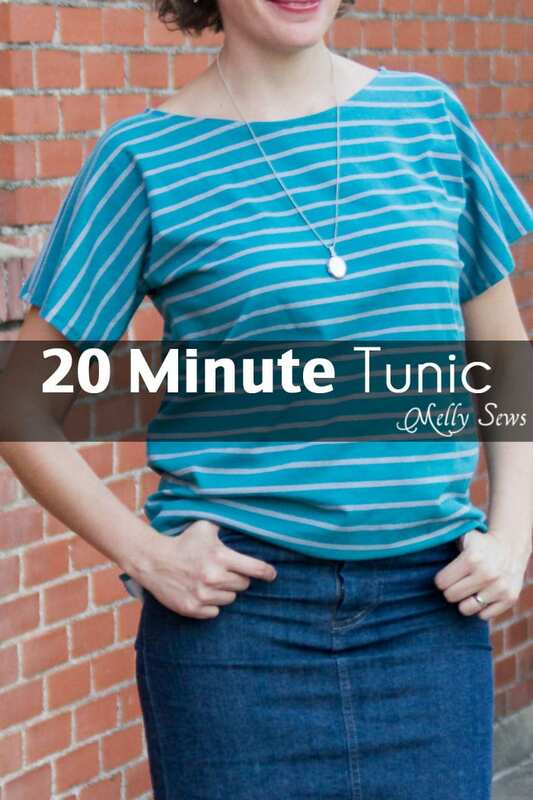 See this post for all my best tips and tricks for sewing knits. 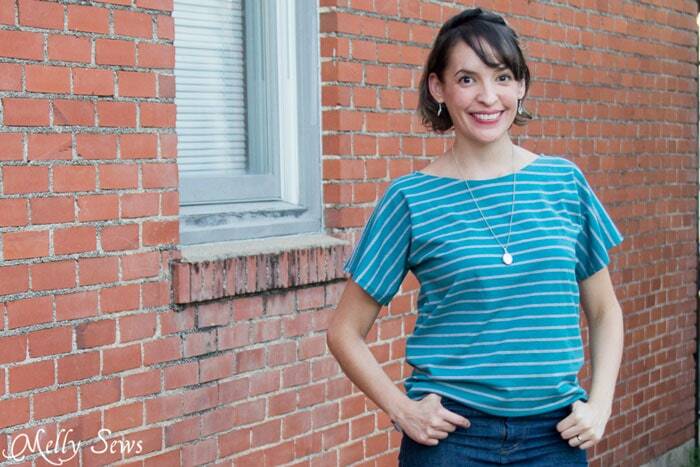 Since knits don’t unravel like wovens, you can be finished after sewing those seams. Or you can finish the edges by turning them 1/2 inch to the wrong side and stitching to hem. If you cut curved edges, you’ll fold and press them as well, but when you fold around the curves, you’ll have some wrinkles that will end up on the back side. These are okay, and they won’t show on the front side. Hem, using a stretch stitch and you’re done! For this look, I added my denim skirt and some heels and half tucked the front of the shirt. When it cools off a little here I think this top will be great over leggings with a belt. And for even colder weather I think it would be cute over a long sleeved fitted t-shirt or turtleneck too. Thanks SEW MUCH!! I will have to do this! Happy sewing! I love this! And the link to your advice about sewing with knits. I find your blog so clear and helpful. Thank you! Love the boat neck line! Great sewing! Would it work to make it wider and have longer sleeves? Nope, math is correct for the tunic that is shown. For larger sized hips, so you don’t end up with longer sleeves and a lot of fabric to cut off, you might want to go with 2x the shoulder to shoulder measurement as your width as long as that width is at least 8 inches more than 1/2 your hip. If you’re very pear shaped, you might want to go with a more trapezoid shape, 2x shoulder width at top and 1/2 hip plus 8 inches at bottom. Thanks for the great tutorial –just one question….in your diagram you have indicated a 4 inch X 3 inch cutout for neck opening, but no inch measurement as to how much to cut on the sides for the sleeve formation…or did I miss it?